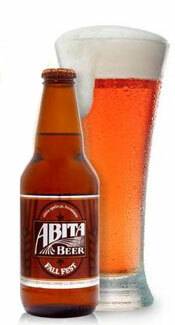 The Abita Brewery, located in Abita Springs Louisiana, brews its beer with water from artesian wells in Abita Springs making it rather unique as no other brewery has claim to such water. Whether or not this really makes a difference in the beer is up to you. Appearance: Pours a crystal clear golden amber with about two fingers of off-white, fluffy head. Head retention only stuck around a little while before relaxing into a thin film. Sadly there wasn’t much lacing to speak of. Smell: Soft and bready. The usual Oktoberfest suspects are there – bread/cereal grains, malt and yeast but they are not easily picked up on. While this smells sweet and grainy, everything seems a bit too subdued. Initial Taste: The taste followed the smell pretty closely at the beginning with a nice sweetness from the caramel malts and cereal grains. Thankfully the hops came through with a needed bitterness to help cut the cloying malts. Again the flavors were there but everything had a washed out flavor as if it had been watered down. Finish was a little dry and bitter. Thoughts: The Abita Brewery, located in Abita Springs Louisiana, brews its beer with water from artesian wells in Abita Springs making it rather unique as no other brewery has claim to such water. Whether or not this really makes a difference in the beer is up to you. Personally I’ve always liked Abita and their fall seasonal is no let down. While it won’t do much for the hop heads or big flavor lovers among us, there is enough character to keep this beer at the top of their sales charts. I think their biggest sell with this particular beer is the fact that it’s extremely sessionable and easy for new craft beer lovers to drink. Would I buy this again? I doubt it. This is not a slight to the beer, there is just too many other great American style Oktoberfests out there that DO meet my hop and flavor requirements. But don’t just take my word for it. Go out and try this for yourself and let us know what you think. Cheers! I’m having my fist six pack of this beer now. I was in the mood for something light and easy to drink. since I haven’t drank a variety of beer but I always like trying something new and the clerk at the headshop apparently knew what he was talking about. It’s very easy to drink and it doesnt overwhelm you with strong flavors, yet the taste is there and it stands out when compared to the usual lighter beers out in the market. So far, it’s put a smile on my face. I’m glad I got it.